Lt. Col. Bo Gritz, America’s most highly decorated Green Beret, tells MD, Jr. that the CIA is involved in the illegal drug business, namely heroin from Burma. CAMP LEATHERNECK, Afghanistan (Reuters) – Thousands of extra Marines pouring into Afghanistan’s opium-growing heartland will go after those who process drugs but not those who grow the crop, the commander of U.S. Marines in the area said. Brigadier General Larry Nicholson, commander of 10,000 Marines in Helmand, which produces the bulk of Afghanistan’s and the world’s opium crop, said his forces did not want to alienate local farmers by targeting the crop. “The reality we have to face right now is that the number one cash crop in this area is still the poppy. We are not making war with the poppy farmer,” Nicholson said in an interview with Reuters and CNN at Camp Leatherneck, the Marines’ sprawling desert base in Helmand. The U.S. Marine force in southern Afghanistan is set to nearly double over the next few months, the main combat element in the first wave of 30,000 reinforcements dispatched by President Barack Obama this month. Efforts to persuade farmers to grow other crops in Helmand have had some success, in part because of the high price of wheat and a glut of opium. 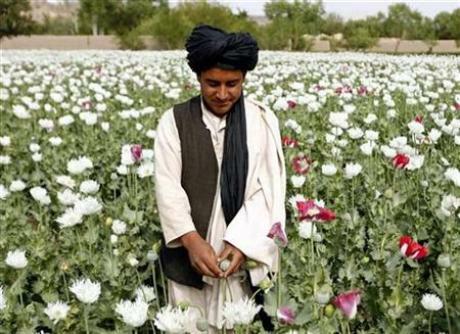 Farmers cultivated a third less land in Helmand with opium poppy this year than last year, according to the United Nations, but because of a bumper crop the amount they produced was down only about 22 percent. 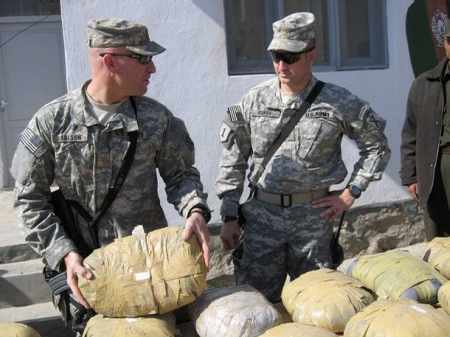 The 4,100 metric tons produced in Helmand are still about 60 percent of Afghanistan’s crop, which accounts for more than 90 percent of all global heroin trade. 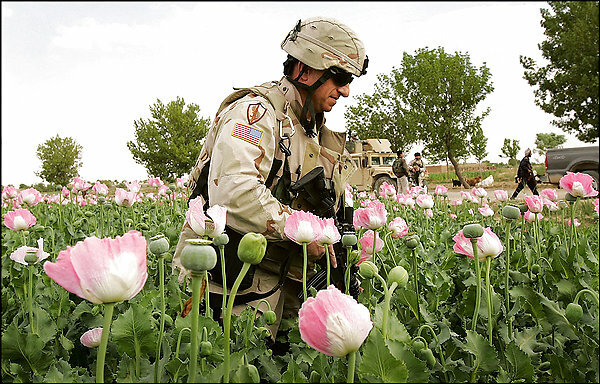 Marines study opium farming, and have even planted some in a garden on their base so that troops on patrol will know what it looks like and be able to tell when they see it how long it has been growing. 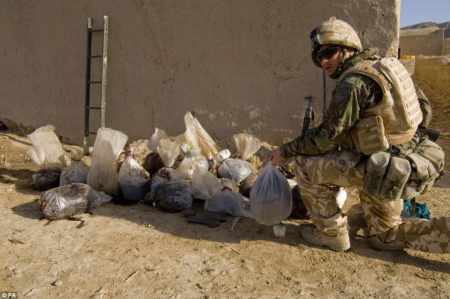 Nicholson said Marines often found black-tar opium alongside bomb-making materials during their raids, a sign of the link between the trade and the insurgency. “We will go after the processing plants and the labs. We will go after those with great vengeance. We will destroy the poppy seeds if we find it. What we have been very careful not to do is make an enemy of the poppy farmer,” he said. He said farmers had told his troops they were happy the Marines had driven out the Taliban but had made clear they had no plans to stop growing drugs. British and American programs were being set up to encourage farmers to grow other crops like wheat, but in some areas it was still not always possible to earn a living growing food crops and get them to market safely.